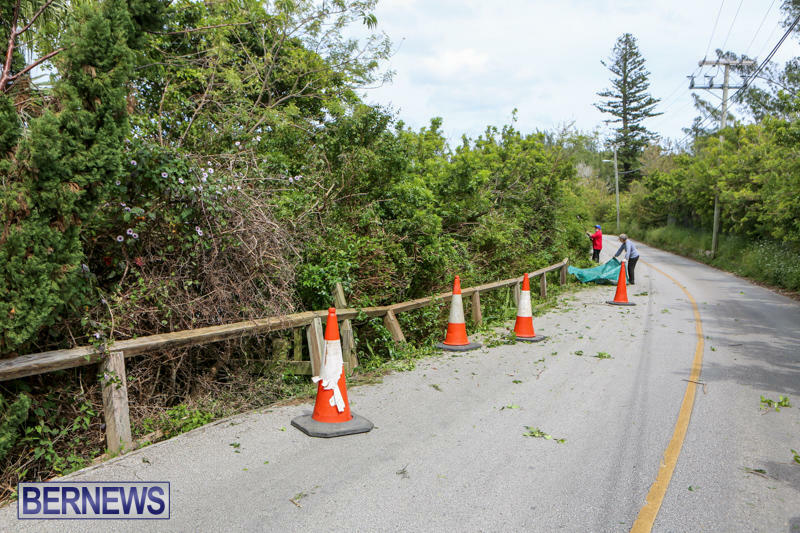 After seeing a vehicle drive over the line to avoid overhanging trees on St David’s Road, area resident and business owner David Roque made calls to express his safety concerns, and after he was unsuccessful in getting the trees cut, Mr Roque took matters into his own hands and went out yesterday [April 29] and cut the trees himself. 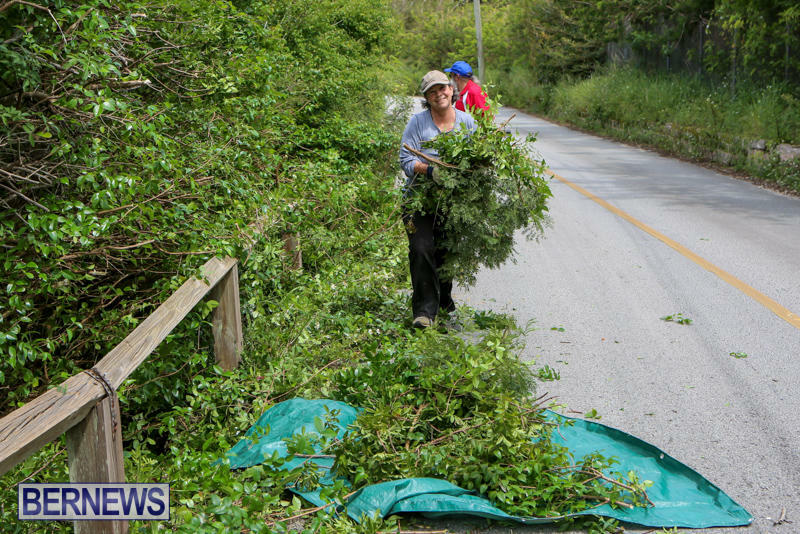 One of the people Mr Roque contacted to voice his concerns was St. George’s South MP Suzann Roberts-Holshouser and he told her that if the relevant Government departments would not take action, he himself would go and trim the overhanging trees. 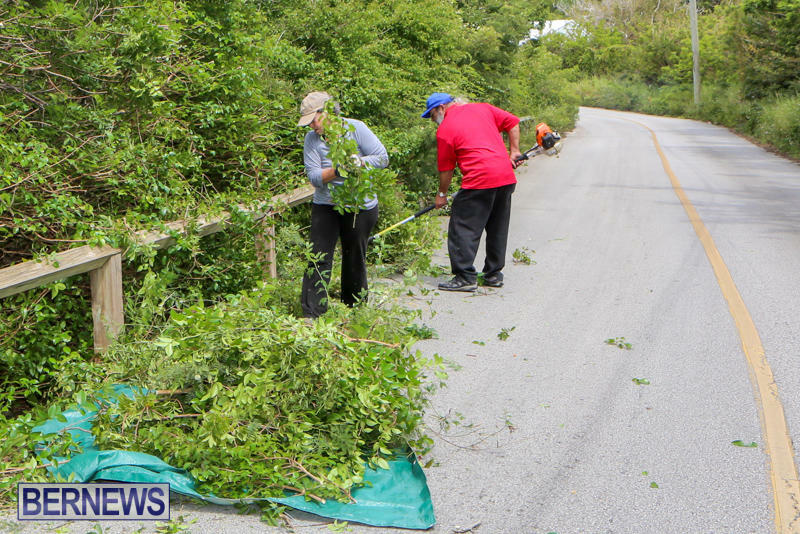 Ms Roberts-Holshouser told Mr Roque she would join him to assist in clearing the debris, and when Mr Roque contacted her yesterday to say he was going to cut the trees, the MP came out and joined him in the work. Mr Roque told Bernews, “First of all, what I’m doing here is cutting trees and the reason I’ve called Suzanne Holshouser to ask to trim the trees because the buses are coming on the opposite side of the road. “To prevent accidents, I wanted the trees cut. No one came, so I decided to come cut them myself.And Suzanne Holshouser has come out to support and we’ve had nothing but good comments,” added Mr Roque. Ms Roberts-Holshouser said, “It’s the likes of David Roque who makes what community living is all about. If it wasn’t for the likes of David, who takes the initiative, who doesn’t do the talking, who actually does work…I wish every single constituency and every single parish in Bermuda had a David Roque. “It’s one thing to be able to complain about it; it’s another thing to actually get something done, and I think that, when David goes to bed tonight, he will rest knowing that he’s done something not just for himself, but just for his family, but for the community of St. David’s, and for that I’m very proud of him,” added Ms Holshouser. It’s a great jesture…but it shouldn’t come to this. Homeowners on the roadside always turn a blind eye to their trees and hedges taking over the road and potentially causing accidents. It seems to be the problem of Ag & Fish or BELCO as they go about the Island cutting the trees back and down from wires. Sometime ago a lady was out weed whacking from the corner up from the area to the bus stop on both sides from where these pictures were taken. Mr. Bruce Paynter was another one who organized a grand cleanup of the Great Bay Road many many years ago there was always a large pot of curried fish or something on an open fire he and his community buddies erected a flag pole built bbq’s which were well used regularly by persons who frequented the area this cleanup included the little battery parking lot area and the bay area to Smith’s Hill or should I say beverly hill no matter what wss there it was pulled yanked burnt and hauled away the ladies from the seagull club would always support positive community efforts with food and cold refreshments now the seagull club is another story. Great women who would race from st davids docks to ferry reach and back using the honest to goodness seagull engines many great weekends and evenings spent with Newki Ruth Betty Florrie Ella June Judy Edna Bertha and those names I have forgotten up at the battery area where I believe there is a nursery now St Davids a beautiful community and most wonderful people. I have know David for almost 50 years. Always looking out for the welfare of others an his neighbors. Susan was spot on when she said every parish et al needed a David Roque. If you want something done right… Good on you both! I have a problem understanding why there is such a big problem with overhanging trees along our roadways. W&E used to do a commendable job in managing the problem – where are they? Remember you also Mr. Rose. Mockingjay..why???? What do you think Chris Furbert can tell us! I was talking about their boss Craig. Was Levitto Foggo to busy to help??? Only plpers have time for negativity on every positive article. How about the PAC on Port Royal? Did the article say he CALLED Levitta Foggo?????? All home owners and W&E should be cutting back trees and clearing out what the hurricanes destroyed throughout the island. We tried to contact W&E but nothing has been done. There are trees along the roads near electric wires. Hopefully, all of this will be cleared soon. Well if they stop all those Union meetings and calling in sick…………………………………..
St David’s roads are going to be busy this summer Eastern County hoping Belco Cup and any other games that BCBC want to play. Tell you where W&E are they are busy cutting secondary roads verges so no-one can see them – Parsons Lane, Vesey Street & Barkers Hill to name a few. Cutting 10′ into these areas instead of cutting green growth only and moving quickly on primary roads!!! This added to the new wagons to enjoy the extended breaks and long lunch hours in, New double cabs truck with flashing lights and Supervisors with white shirts doing nothing. OK tell me we are not over paying and under performing?? Bring back the old days of Ag & Fish doing the job. Taxes…what are we paying them for!? election time just be around the corner…. No, just getting it done. Still 2+ years away. Great Job to Both of these residents. We all should organize this kind of activity in our respective parishes and we can start to take more pride in the way that our island looks. The overgrown trees and sinkholes in the roads is really a danger to the motoring public. There needs to be a war waged on the Mexican pepper trees. They are a curse to this island and are strangling all of our native hedges. All residents with their private property overgrown trees hanging into the public roads and on power lines should be fined. Belco can cut the trees but the bill should go to the property owner. We certainly miss the trucks of men who would drive through the island and cut down all of the high branches and keep all the hedges along the roads neat and clean looking. What happened to the roundabouts? They look like they are starving for attention. Come on Bermuda! We need to clean up this place. Well done David and MP Roberts-Holhouser. MP Foggo did not appear to have been called if you read the story. W&E had been in St David’s trimming the trees but they stopped before they got to that stretch of road. As a St David’s resident, I think it’s time some attention was given to St David’s Road. It is too narrow and you often have buses and cars going over the centre line. We have also had a few serious accidents on that road. Maybe the road should be one way in after the junction with Chapel of Ease Road. Everyone after that point could take Southside Road to exit St David’s. MPs Roberts-Holshouser and Foggo, what do you think? Certainly a suggestion to take to the community. I have found in the past that changes to roads often find conflicting opinions, but I am certainly open to taking the suggestion further by discussing the possibilities and then bringing recommendations to the community. Firstly, well done Mr. Roque. You have inspired me to ask some of my own neighbors if we can get together and tackle the overhanging shrubs along North Shore. I’ve seen so many close calls lately, especially when two large trucks/buses are passing by. This is unacceptable – our infrastructure is crumbling down around us! And summer season is upon us, which means more tourists on mopeds…. Why can’t the owners of the property with overhanging trees be responsible for cutting back their own trees. That’s just David, Suzann, and the St David’s way of life. We’d do that with life-saving cannabis for cancer patients, too, if there weren’t a life sentence on the books for cultivation. I’m flabbergasted you lot haven’t fixed that yet… yesterday in Rhode Island, I helped take a pound of cannabis oil into the House Judiciary Committee hearings on the new cannabis legalization bill, and the world did not come to an end, despite the excess (only 2.5 oz are legal now). You know, not every single story is about cannabis. I know you think it is, but it isn’t. Kudos to David and Suzanne! People always find the time to get on social media, gather at the grocery stores, and stand on the sidewalks of town to grumble and complain just about everything, but they can’t (or won’t) get off their backsides to assist anywhere! To those people who have hedges and trees obstructing the roadways, SHAME ON YOU for your negligence. You should be warned first and then fined big time and be made to pay your fines straight away! . Sorry but for all naysayers, W n E take care of public lands and private land owners are required to cut back any roadside vegetation. It was a great opportunity to do something that was right and needed to be done. I have no hesitation in adding, that should we have thought we needed more hands and indeed had the time as this was an “unplanned” project, I am sure MP Foggo would have been more than happy to have helped. Looking forward to the W&E team returning to St. David’s to finish the job they started once they clear the roads for the 24th May Marathon. Many thanks to david to show how the OBA is helping the east end!! This exercise is all about public safety and not the negative comments. Heaven forbid if an accident did happen there….and guess what?…the MP would be blamed for that too. Trust me when I say that if Lovitta would have known about this, she would gave been there. To all of you asking of her whereabouts try asking the resident MP where is she when it comes to being visible in the St David’s area schools!! Ms Lovitta Foggo JP MP is to EVERY….I repeat…EVERY function at the schools in the East End period!! The area in question is government land. It was part of the land reclaimed when the base was built. You can clearly see the trees are close to three feet beyond the fence railing. Why has this dangerous situation been allowed for this length of time? Who is responsible for scheduling the cleaning of our roads? Why hasnt this stretch of road been cleared given it is clearly a danger to all road users? David and Suzanne should be commended for doing what we taxpayers pay our government to do. Clearly something is wrong with the way things are being done with little or no proper management of the road crews. Again who is responsible for seeing that our roads are kept safe for all road users including maintaining the hedge rows? Almost all the work that was done in the east end was on the hard shoulders which did not obstruct traffic or was dangerous to road users so the question is asked again why wasn’t this stretch of road made a priority given its impact on road users and possibility that an accident was imminent given the state of that stretch of road. On another note they have saved us money doing in one day what it takes seven men two or more days to do. They should dump all the branches on Union Square. And the UBP/OBA apologist continue to excuse the relevant department ministers of dereliction of duties . What’s equally disgusting is the way St. George’s South MP Suzann Roberts-Holshouser deflected the issue of A NEGLIGENT GOVERNMENT , by joining the grassroot project initiated by the star of the show Mr.Roque , instead of making her counterparts in the UBP/OBA accountable . Hopefully David isn’t charged for dumping the waste at the dump. Thirty years ago, roads were kept clean, round abouts well manicured and our Botanical Gardens also displaying lots of flowers. Both departments are now too busy to do their jobs. Too busy viewing traffic and taking EXTENDED time to build the sidewalk and the wall on North Shore. Ive heard stories of staff at Botanical Gardens spending more time playing cards and chilling. I have personally seen one their trucks being cleaned in a business parking lot in Hamilton. Where were they SUPPOSED to be?? Those that feel they can’t work an entire day should be released and let others who are willing to do an honest day’s work be given the job. How many have seen one pubic works staff working and 5 others watching?? Perhaps we should start paying them for the work that they DO rather than the work they are supposed to do. Govt could save millions or there would be more productivity. Perhaps we should privatize these departments to companies who are willing to be productive.